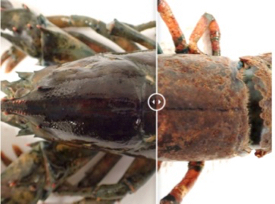 Diseased Lobster Epizootic shell disease can lead to pitting, erosion, and "melanization" or darkening of a lobster's carapace. Survival of moderately and severely diseased lobsters—those with disease on more than 10% of their cuticle—is only 30% that of healthy animals. © J. Shields/VIMS. An earlier spring may sound nice, unless you’re a New England lobster. New findings reveal that as coastal waters in the northeastern U.S. continue to warm—bottom temperatures in Long Island Sound have increased 0.7°F per decade over the last 40 years—resident lobsters are becoming increasingly susceptible to epizootic shell disease, a condition that has depleted the southern New England population and severely impacted the local lobster fishery. The findings stem from a collaboration between the Virginia Institute of Marine Science and Dominion Energy’s Millstone Environmental Laboratory. The lab maintains a unique, long-term record of lobster abundance and health in waters near Dominion Energy’s Millstone Power Station in Waterford, Connecticut. The research, funded by NOAA’s Saltonstall-Kennedy Program and led by then postdoctoral associate Maya Groner of VIMS, suggests that the increased prevalence of shell disease in area lobsters stems from two factors—an earlier onset of warmth-induced spring molting, and hotter summers. Groner and her co-authors—professors Jeff Shields and John Hoenig of VIMS along with Don Landers and John Swenarton of the Millstone Lab—published the results of their work in the most recent issue of American Naturalist. “We used the lab’s mark-recapture dataset, now going on 37 years, to investigate relationships between temperature, molting phenology, and ESD [epizootic shell disease],” says Groner, currently a research ecologist at the Prince William Sound Science Center in Alaska. Phenology refers to the study of how plant and animal life is affected by seasonal changes. “Our work shows that temperature increases due to climate change have caused a phenological shift in the molting patterns of lobsters, making them more susceptible to the disease,” says Groner. The team’s results pertain mostly to male and juvenile lobsters, as females have a different molting pattern, typically molting every two years in the region. 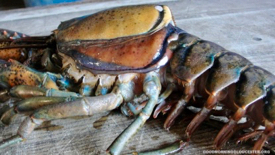 As the name implies, epizootic shell disease occurs when the bacterial populations that normally inhabit the surface of a lobster’s carapace change and begin consuming the cuticle, causing it to erode. The current study shows that when a diseased lobster molts, discarding and replacing its shell in order to grow, it essentially sets the disease clock back to zero. Thus when spring warmth—a seasonal cue for lobster molting—arrives earlier in the year, lobsters also molt earlier in the year, giving the disease a jumpstart on its progression into and through the summer months. The researchers found that for every 1.8°F increase in the average May bottom-water temperature, lobsters molted about 6 days earlier in spring. In turn, during early-molting years—defined as those in which at least 5% of lobsters were observed to molt in May—disease prevalence in September doubled from about 15% to more than 30% relative to later-molting years. During the latter years, only 1% of lobsters were observed to molt in May, and the remainder in June or subsequent months. The research team discovered that disease prevalence in October correlates even more strongly with summer heat. 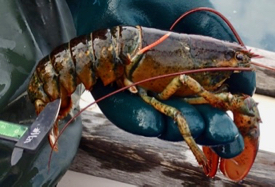 In years with 90 days exceeding 68°F they detected epizootic shell disease in around 65% of lobsters, but found only 40% were diseased when the summer had 50 or fewer days above that threshold. In years with both warm springs and warm summers, disease could exceed 80%. Indeed, 2012, one of the warmest years in recent history, had the highest disease prevalence of all years for both juveniles and adult males. 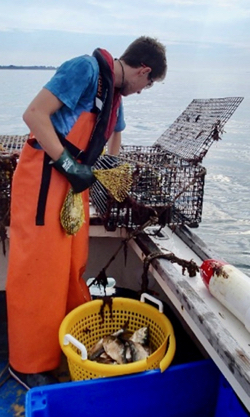 In addition to the observed impacts in Long Island Sound, the researchers say their findings portend troubling possibilities for lobster populations elsewhere in the rapidly warming waters of New England.